You are browsing: All The Ghost Map: A Street, an Epidemic and the Hidden Power of Urban Networks. 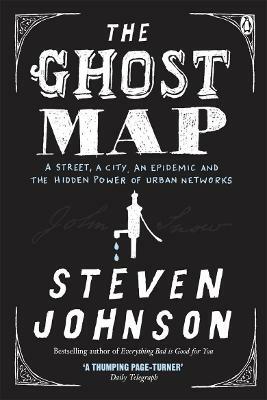 From the bestselling author of Everything Bad is Good For You, Steven Johnson's The Ghost Map vividly recreates Victorian London to show how huge populations live together, how cities can kill - and how they can save us. Steven Johnson is one of today's most exciting writers about popular culture, urban living and new technology. In The Ghost Map he tells the story of the terrifying cholera epidemic that engulfed London in 1854, and the two unlikely heroes - anesthetist Doctor John Snow and affable clergyman Reverend Henry Whitehead - who defeated the disease through a combination of local knowledge, scientific research and map-making. In telling their extraordinary story, Steven Johnson also explores a whole world of ideas and connections, from urban terror to microbes, ecosystems to the Great Stink, cultural phenomena to street life. Steven Johnson is the author of the acclaimed books Everything Bad is Good for You, Mind Wide Open, Where Good Ideas Come From, Emergence and Interface Culture. His writing appeared in the Guardian, the New Yorker, Nation and Harper's, as well as the op-ed pages of The New York Times and the Wall Street Journal. He is a Distinguished Writer In Residence at NYU's School Of Journalism, and a Contributing Editor to Wired.